Harry Cleveland Goodsir. Image courtesy The Harrower Collection. Harry Cleveland Goodsir was born in Newcastle on 3 September, 1891. He was the second of four children of Port Stephens sawmill manager Reuben Goodsir and his wife Eliza nee Aston. Harry was educated in Newcastle at the Hamilton Superior Public School and later moved to Toronto, on the shores of Lake Macquarie, where he became a member of the local Rifle Club and enjoyed playing football. In January 1916 Harry volunteered to serve in WWI. He embarked HMAT A72 Beltana in Sydney on 13 May 1916, a private in the 36th Battalion D Company. He arrived in Devonport, England, almost two months later, on 9 July. After four months’ further training Private Goodsir proceeded to France. In June 1917 Harry received two promotions: firstly Corporal, then Temporary Sergeant Major. The following month Harry’s unit was serving in Belgium, when Harry was wounded in action, receiving an injury to his ankle. He was admitted to the 11th Australian Field Ambulance, rejoining his unit on 7 August. Three days later he was promoted to Sergeant. In November Harry spent three weeks’ leave in England, rejoining his unit in Belgium on 4 December 1917. This N.C.O. has at all times shown great devotion to duty and keenness in his work both when (in) the trenches and billets. When in action his coolness and cheeriness has inspired all ranks with the utmost confidence. His courage has been frequently in evidence and has been reflected in the morale of the men under his control. On 30 April 1918 the 36th Battalion was disbanded in order to reinforce other 9th Brigade units, and Harry was transferred to the 35th Battalion. Severe wounds on upper part of body and head caused by enemy grenade explosion, while occupying a froont line position. Death was instantaneous, occurring in the early morning of 1 June. The burial was conducted on 2 June 1918 at the Chalk Pitt Cemetery, Captain Chaplain Osborne, 35th Battalion officiating. Company Sergeant Major Harry Goodsir was later reinterred at Villers-Brettoneux Memorial Cemetery. Harry was awarded a Mentioned in Despatches honour promulgated in the London Gazette on 28 May 1918, and the Commonwealth Gazette on 24 October 1918. In 1920 Harry’s family left the Newcastle district for Mullumbimby where they ran the local newsagency. In 1925 they relocated to Orange where Reuben became the well known operator of the newsagency and stationers located in Summer Street opposite the Strand Theatre. 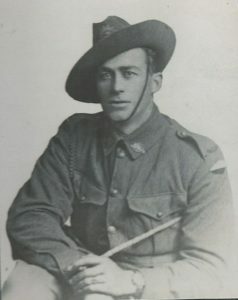 Harry Cleveland Goodsir is commemorated on the Toronto Soldiers’ Memorial, the Toronto Red Cross Honour Roll, the Hamilton Superior Public School Roll Of Honor, the Booral and District Honour Roll and on panel number 125 on the Roll of Honour at the Australian War Memorial in Canberra. He is also remembered on a commemorative plaque in Sandgate Memorial Cemetery in Newcastle and on his mother Eliza’s headstone in Orange Cemetery, Presbyterian Section, Block 8 22. 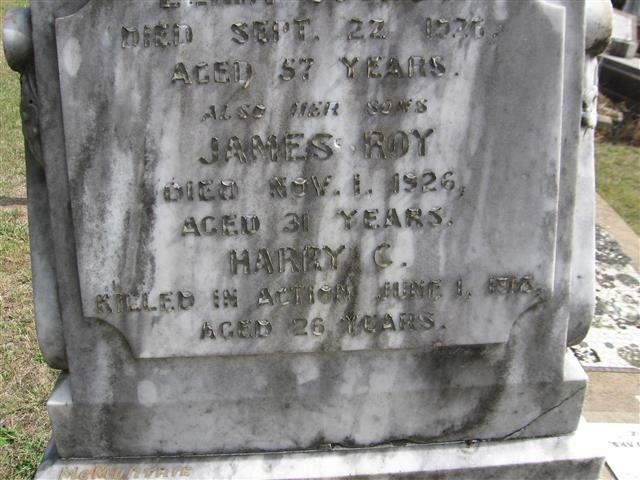 Harry’s brother, James Roy Goodsir, also served overseas in WWI; he was invalided home in August 1915. Harry Cleveland Goodsir commemorative plaque. Image courtesy Orange Cemetery. This entry was posted on June 1st, 2018.